If you save an open bottle of wine for another day, you don't want it to taste bad. You definitely don't want to struggle pushing a cork back in, or tediously pump a stopper into the bottle, only for the contents to spill all over the fridge. *Keep wine fresh and secure, even when laying bottles on their side. *This stopper securely clamps around opened bottles locking in flavor and preserving contents for up to 5 days. *Designed to protect expensive wine, this cap is easy to use at home or on a picnic, simply lock and pop to seal your bottle. *Wine preservation has never been easier, even for those with restricted hand movement, this hermetic seal provides airtight storage and is a great accessory for any wine lover. *Environmentally friendly, reuse old wine bottles for water, juice, dressings, marinades or olive oil and help the ongoing effort to reduce negative environmental impact. 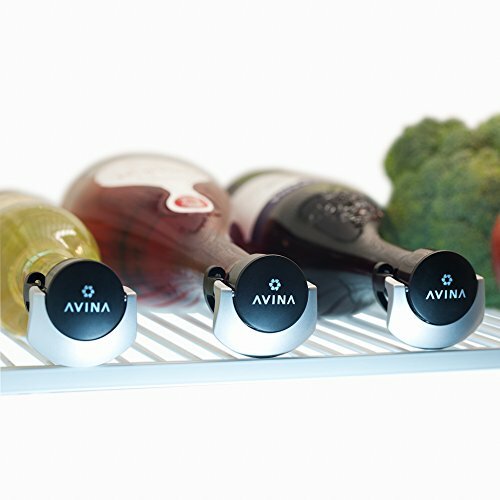 AVINA bottle stoppers are designed to work with over 90% of wine bottle sizes, but with so many variations we can't guarantee it will fit all. *This wine bottle stopper is not suitable for most Champagne, Cava, Prosecco or Sparkling Wines. At AVINA, we want all our customers to be completely satisfied. That's why we introduced our 'You Break It, We Replace It' scheme. Once you register your purchase, if you subsequently break your wine stopper set we replace it, see pack for details. Your complete satisfaction is important to us. Try our wine saver products risk-free on every purchase.